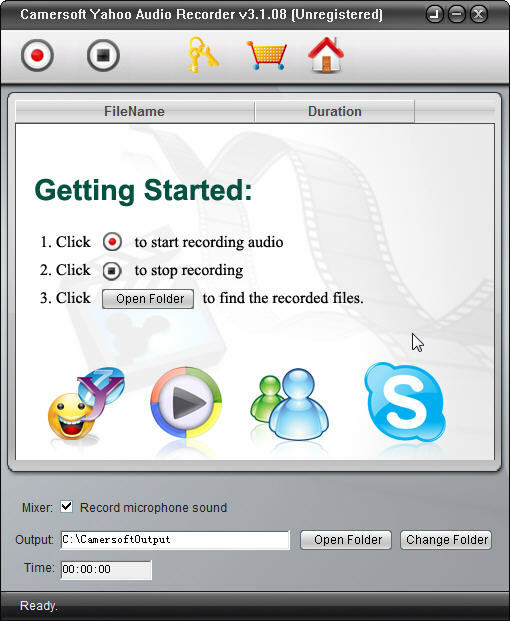 Camersoft Yahoo Audio Recorder is powerful and professional streaming audio recording software, which could record Yahoo Messenger audio and voice during your chat with your friends and save as MP3. Actually it could also work with Skype, AIM, Windows Live Messenger and other IM tools to record your internet call easily.In addition, this Streaming Audio Recorder uses virtual sound card to capture any sound played through your sound card. ...... like MySpace, Napster, Rhapsody, CNN radio, BBC radio, AOL radio, etc. * Very easy to use with simple and friendly UI. sound, so the audio recorder could provide best quality for you. Many young people enjoy music service on MySpace, Napster, Rhapsody or Pandora, etc., where they can enjoy popular songs and online music. With Camersoft Streaming Audio Recorder, you could save the audio from streaming music sites easily, no matter whether that online music was protected by DRM or other limitation. Qweas is providing links to Camersoft Yahoo Audio Recorder 3.1.36 as a courtesy, and makes no representations regarding Camersoft Yahoo Audio Recorder or any other applications or any information related thereto. Any questions, complaints or claims regarding this application Camersoft Yahoo Audio Recorder 3.1.36 must be directed to the appropriate software vendor. You may click the publisher link of Camersoft Yahoo Audio Recorder on the top of this page to get more details about the vendor.